How Do Racehorse Trainers Make Money? There is really no definitive answer to the question of how much money an average racehorse trainer earns, as their income can be influenced by both the success of their runners on the track and their other business endeavors. Most racehorse trainers actually rely on several different streams of revenue to make a living. Here are some key ways that racehorse trainers can make money. Trainers traditionally receive a cut of the earnings awarded to horses that finish first, second, or third in races. This money is transferred directly to them from the track’s purse account. Purse earnings can be a huge percentage of a trainer’s income, and a trainer can really make the big bucks if their horses compete well in the more prestigious stakes races (which carry purses ranging from a few hundred thousand to several million dollars). Trainers charge a per diem for each horse that is kept in their stable. This rate includes basics like bedding for the stall, feed, use of stable equipment and tack, exercise rider, groom, and other small incidentals. Owners are still billed for care from a veterinarian or farrier, medications, jockey fees, and a number of other expenses not included in the day rate. Private trainers (who only train for a sole owner) may be compensated on a set salary. Trainers often represent their clients at sales, evaluating prospects and bidding in the sales pavilion. They may also scout prospects that they see at the racetrack. In either scenario (where the trainer brokers the transaction as an agent) they receive a commission on the sale price. This fee is usually 5 percent of the purchase price. It is common for the owners of good (stakes-winning) colts to give the trainer a lifetime breeding right. This is basically a free breeding each year for the mare of their choice, and this right can be resold during years where the trainer does not have a mare of their own to breed. Breeding rights to major stakes winners can be quite valuable, as some stallions command fees of well over $100,000 per breeding. 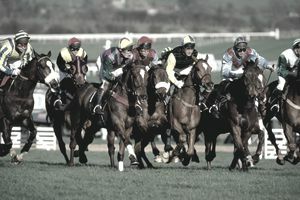 Injured racehorses may need to be on stall rest for months after a significant mishap, and bringing them back to racing fitness can be a long and tedious process. They must be removed from the trainer’s track stalls and shipped elsewhere during this time. While there are commercial businesses offering rehab services, many trainers own layup facilities of their own where they can supervise care during the recovery process. Rehab care can be pricey, and injuries are inevitable in this business, so this is another good niche area of the business to operate in. Some trainers operate training centers where they can begin the training of young prospects, breaking them to saddle and rider so that they can ultimately start working on the training track. Some trainers work almost exclusively in this specialty area, and the money can be quite good once a trainer has built up a reputation in the business. Trainers also claim horses to run themselves or on behalf of a client. (In claiming races each horse is available for sale at a specified price to any interested buyer who registers their interest with the racing office prior to the race. In the case of multiple claims, a number is drawn to determine the winning bidder). If they run the horse for a client they usually don’t receive a commission, but they do get the added revenue from the horse’s earnings and day rate. Many trainers run a few horses of their own, and they get to keep all of the earnings in this case (save for the jockey fees of course). There are examples of the owner/trainer combination to be found in nearly every racing program, particularly in lower level races where it is extremely common.